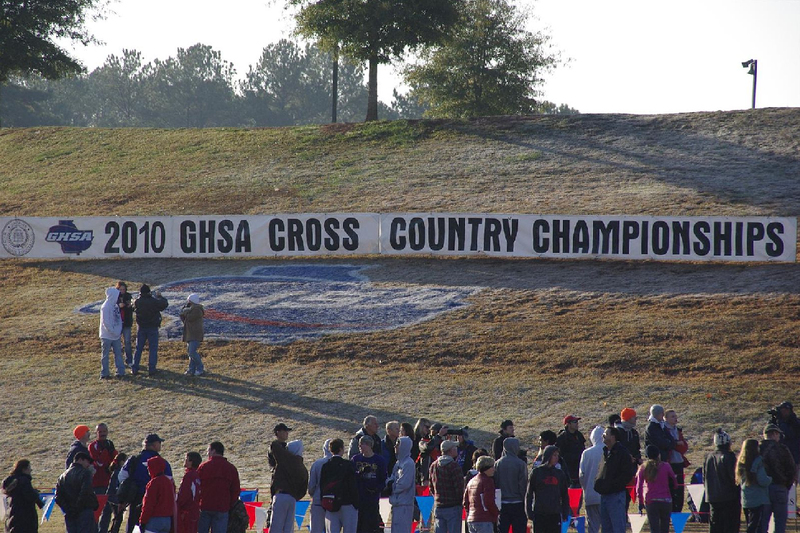 Yesterday was the 2010 Georgia Cross Country State Championships. This year was Payton's second year running cross country and the second year she qualified for and ran in the state meet. Last year as a freshman she earned the seventh spot late in the season and finished with a season best and PR at the time at 20:23. 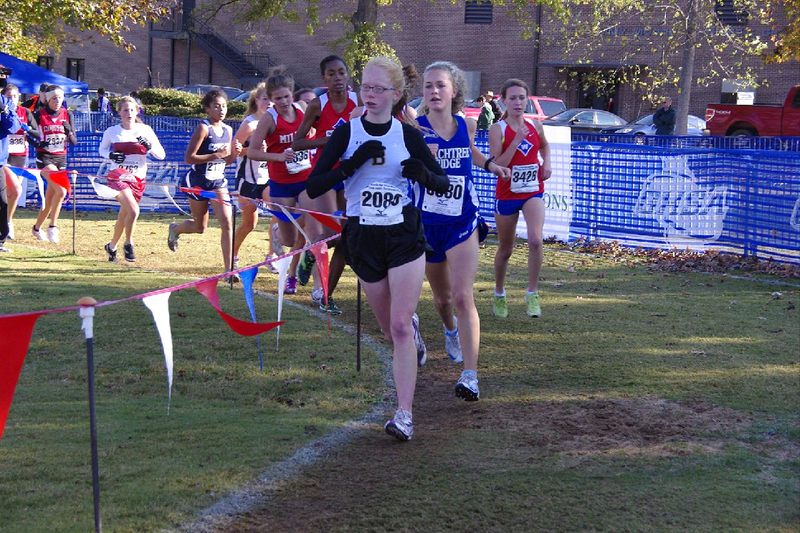 She finished 7th for her team and 56th overall out of 211 in the 2009 State Championship Race. 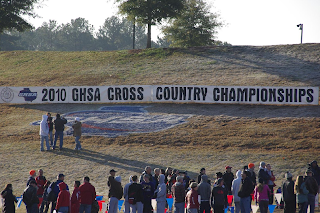 The team finished 3rd in state last year in the AAAAA classification. This year Payton was running solid all year long, PR'ing early in the season and not looking back. 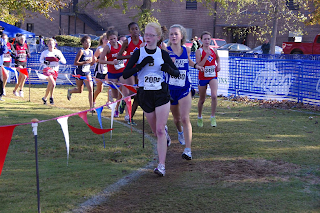 She had one tough race where she was sick while running, but the rest of the season she progressively lowered her times and continued to learn and run smarter all the time. She ran ranked first for her team most of the year mainly due to some other girls injuries. Luckily for the team those girls were on the mend and came back strong to help the team finish great in yesterday's state meet. 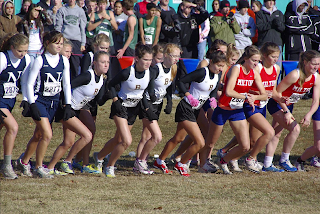 Going into state yesterday Payton was running second or third for her team depending on the race. They had some tough competition with both North Gwinnett and Collins Hill who took 1 and 2 last year. In the Gwinnett County Championships earlier in the season Brookwood finished nestled in between North Gwinnett and Collins Hill in a very close race. Knowing this and watching them throughout the season Coach Carter knew that it would be possible to pull out a victory at state, but that it would be difficult. Saturday morning was the coldest morning we have had this fall in Georgia. 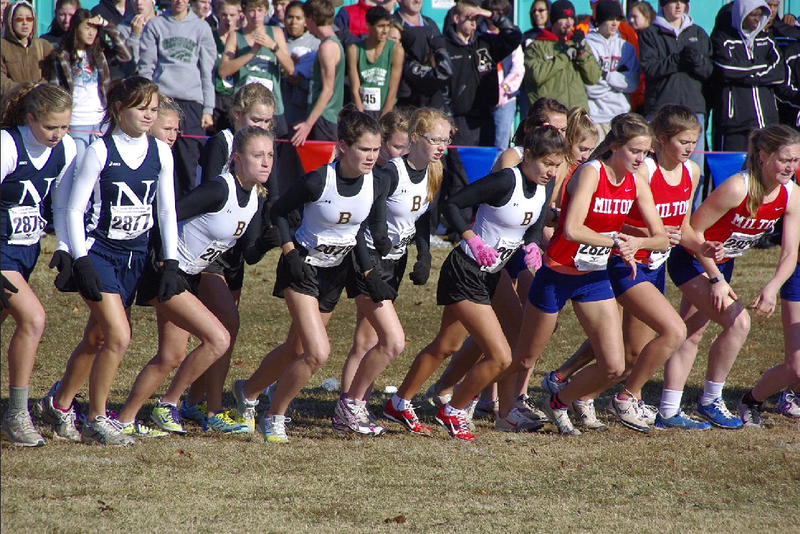 When we arrived in Carrollton to watch them run we were greeted with 32 degrees and a little wind. We were not too concerned because they weren't supposed to run until 10:30 and by that time it was supposed to be somewhere in the 40's. I am not sure the 40's ever came, but if they did it was the low 40's. Payton ran another awesome race. She went out strong and moved when she was told to by her coach. She took some key spots throughout the race as did her teammates. In the end it was a very close race with Brookwood edging out both North Gwinnett and Collins Hill by as small a margin as possible. Brookwood scored 150 to North Gwinnett's 151 and Collins Hill's 156. The upset of the day was Walton who snuck in there and scored a 128, enough to take the championship. 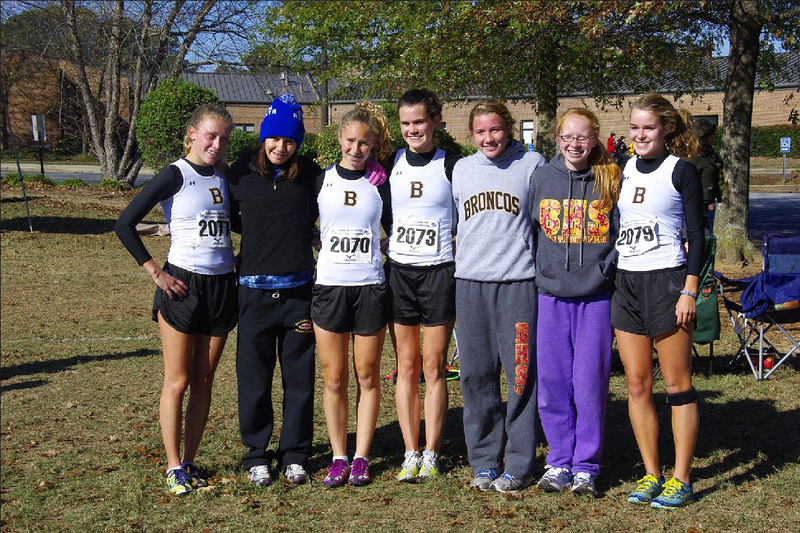 Brookwood finished 2nd, the highest place in 10 years. Payton ended up with a third place finish for her team beating out many of the top runners from other key schools with her 23rd overall finish out of the 223 that ran. She ran a smart race and ran as she was supposed to. The whole field was slow and so the times were way off. The winner of the race finished just shy of 19:00 which was surprising. Payton finished in a flat 20:00, one of her slower times for the season proving as well that the course was running slow with the conditions for this race. Congratulations Brookwood Girls, and Congratulations Payton and all her teammates! Not any less of an achievement, but a little bit out of the scope of what I am writing about today. The Brookwood Boys once again pulled out a State Championship to go with their win last year. Congratulations Brookwood Boys! Awesome! Congrats, Dad! We're just a few years behind you! Thanks Colin! Looking forward to watching you talking about the same. Already enjoyed hearing about what you got going on!